Hello, Our goal is to bring awareness to the general public of the Hazards and Dangers of driving with impaired headlights. And to offer affordable solutions for headlight restoration as apposed to the alternative of more costly headlight replacement. Stop waisting your hard earned money on these instore products! We restore headlights the right way. No quick wipe-on products, using cheap restoration kits, or buffing the lens applying a wax and calling it a day. Our headlight restoration process includes a series of sanding steps, followed by our trusted polish system and finally coated with a durable uv coating to not only ensure crystal clarity but also a long lasting shine. 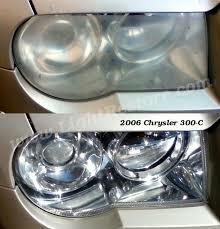 - Oxidized headlights can be found on 7 out of every 10 cars over 3 years old on the road. 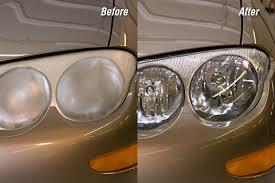 - Most drivers are likely driving with oxidized headlights that greatly need to be replaced. - Poor driving visibility is the leading cause of nighttime traffic accidents. - Discolored, hazy headlights reduce a driver's night vision by 50% (75 feet). Oxidized, foggy headlights can decrease light projection by 75% (37.5 feet) of visibility exposing the driver to an even higher risk of being involved in a nighttime driving accident. * Improves your lights efficiency. * Extends the life of your bulbs. * Raises vehicle Market Value!